My ancestors called this graceful plant Lamb’s Tongue. 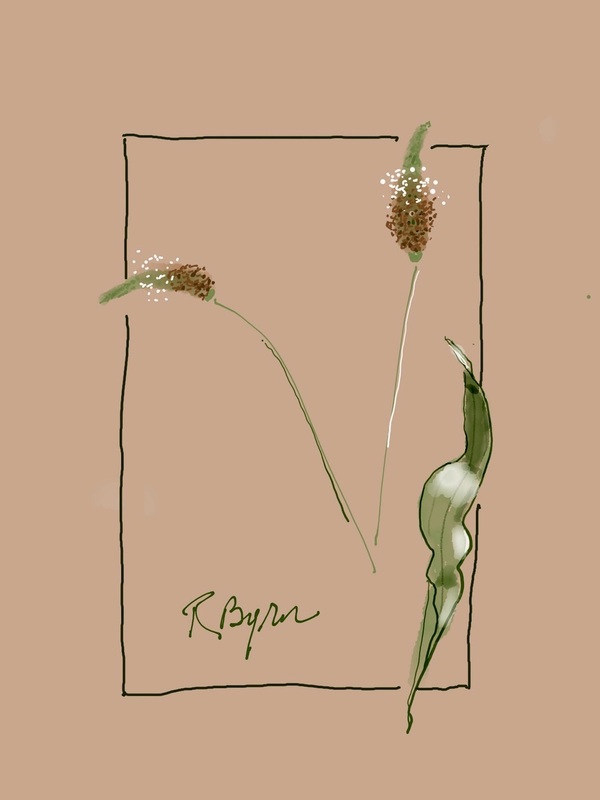 It is Narrowleaf Plantain, Plantago Lanceolata, aka Ribwort Plantain, English Plantain, and maybe other names. It has a close cousin which also lives here: Broadleaf Plantain. Much of what can be said of one is true of the other. This elegant plant is astonishingly durable and very friendly to humans. It is documented to have existed in what is now Norway 10,000 years ago. It can and does live anywhere from dry roadsides to places as wet as rain forests. The oval-shaped part at the end of the long delicate stem (named “the ovoid inflorescence”, I learned) is made up of tiny white flowers that produce one or two seeds each. The plant also reproduces asexually by cloning. Needless to say it is widespread in the world. It is native to Eurasia and was introduced to the U.S. from the British Isles, and is so common it is generally classified as an invasive weed, which strikes me almost as a personal insult. Older generations of folk ate the leaves of both Narrowleaf and Broadleaf Plantain for food and also used them for medicine. It was probably a staple in the diet and pharmacy of any Stone Age people who lived where it grew. It is high in calcium and Vitamin A, and can be eaten similarly to spinach or other food greens: young leaves can be eaten raw, and older leaves cooked. 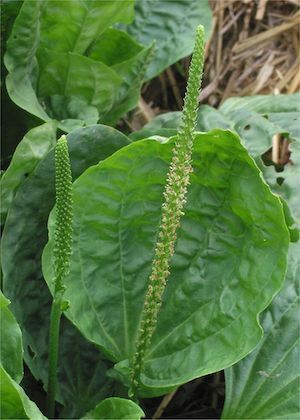 Medicinally, science has shown that plantain extract has a wide range of good biological effects including wound healing, reducing inflammation, relieving pain, and acting as an antioxidant; further, it is a weak antibiotic, it modulates the immune system, and is an anti-ulcerogenic agent. Our ancestors made a remedy tea from the leaves for coughs, diarrhea, and emotional trauma. Also the leaves, bruised, were used directly on the skin for infections and as a pain reliever for injuries, insect bites, splinters, boils, and toothache. It is known as a drawing herb, said to have the power to pull out toxins and foreign substances from the body. Some herbal healers have said it draws out bad emotions and soothes the mind. 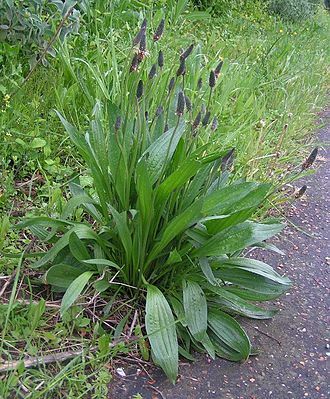 Here are photos of Narrowleaf and Broadleaf Plantain, respectively, thanks to Wikipedia. My backyard is “too shaded” because of many big trees on two sides. Its grass is thin in places and never thick in others. This non-lawn and the flower bed and the shrub bed that have both been there for many years are home to a sequence of flowering plants that wake up spontaneously every year and bloom in their turn as their seasons arrive, with no help from me unless you count admiration. Some of the flowers are wild and some are cultivars put in as long ago as half a century by the house’s one former owner. I will be forever grateful to her. 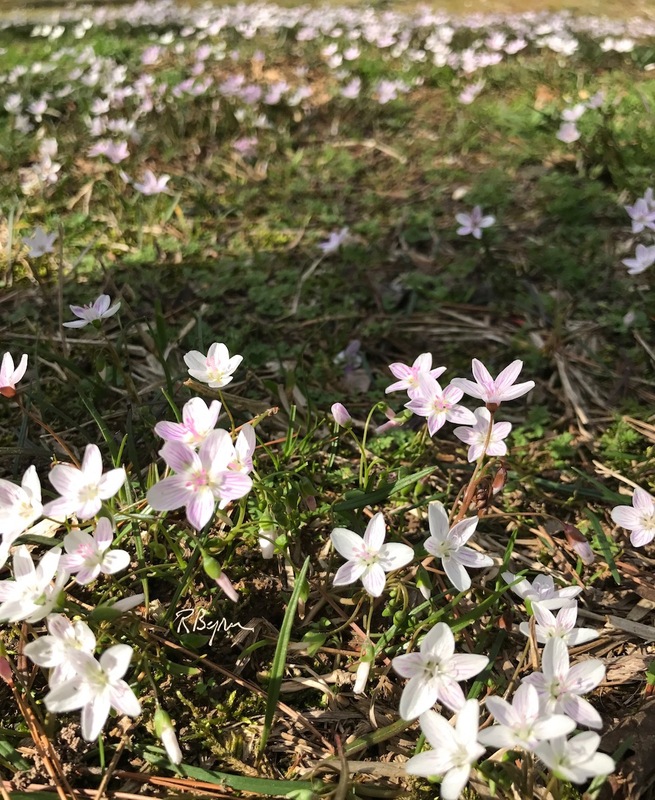 So far this year the backyard flowers have been Carolina Spring Beauty–here is an on-site photo of those from this year– plus Jonquils, Dogwood, Dandelions, Azaleas, Fleabane, Iris of three kinds, Hyacinth, Henbit, Violets, Roses, and Wild Strawberry blooms. And some mushrooms, always exquisite. I repeat, I did nothing to cause all this wonder. The one dogwood tree is old and elegantly thin. Having already quietly bloomed and finished, it is putting out leaves. 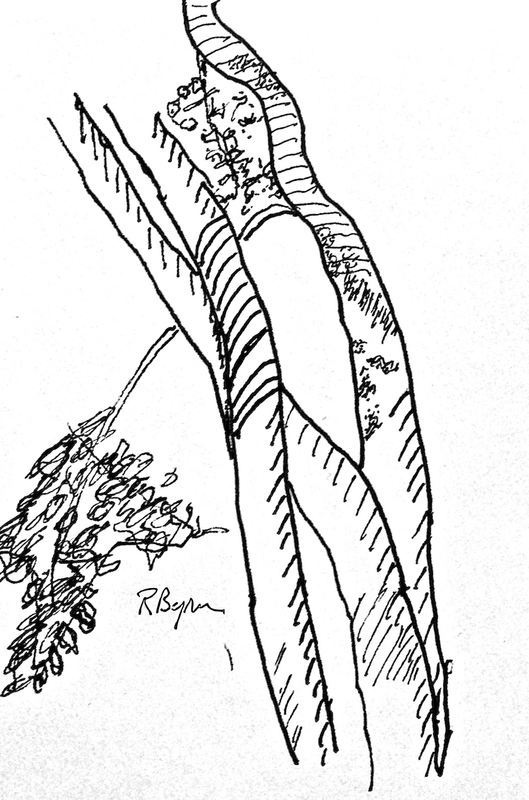 Companion to the dogwood is its contemporary, a crape myrtle with multiple trunks, each six inches thick. The color of the trunks is unnameable, a neutral soothing color. Two of them have twined around each other. They will put out their watermelon-colored blooms later in the year when the sun rises higher. Four large oak trees survive to live inside the fence. A years-old thick wild grape vine has formed an arbor at a far corner. Lining the outside of the fence on two sides and part of another are tall oaks and pines growing in the neighbors’ back yards and overhanging my yard, and behind those trees are more big trees, altogether creating almost a forest around me. 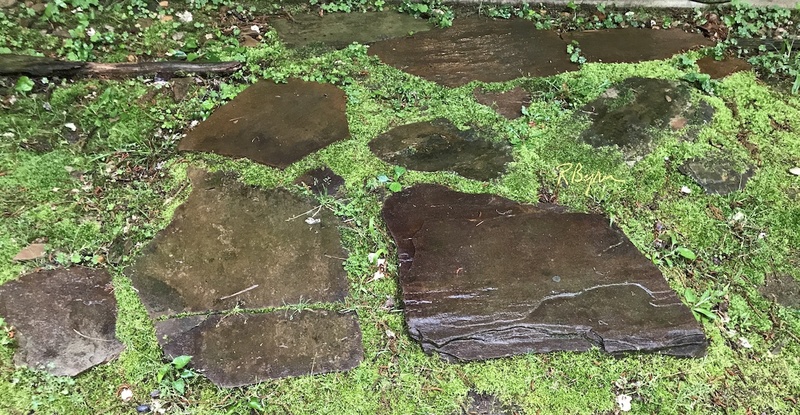 Leading out from the house into all this (and back in) is a short stretch of flagstones with moss of a refreshing lime color that couldn’t live with more sun. I like it that the yard is “too shady”. It is very green out there, the kind of green that can become part of you, the same as your breath, to renew and reassure you. I am put in mind of a song from high school glee club, the music and the words vibrating through us. to arch your prayer and mine. unto the clear blue skies. Dang – you really are COOKING. Jealous. Makes me feel lazy. But how I love these posts! Gail, glad you like the post. This was actually an oops, premature publish, but I fixed that and it seems to have turned out all right. Cheryl, so glad you liked the post. I hope my premature publishing of it didn’t detract too much. You probably know by now I fixed it. Thanks for your kind words.